Project Description: The minimalist existence of flowers verses the overwhelming entirety of the world. Adhere vintage map onto the chipboard using double tack. Make a copy of a handwritten page on the transparency film. Cut out a square “window opening” in the transparency film, remove paper liner and adhere to map. 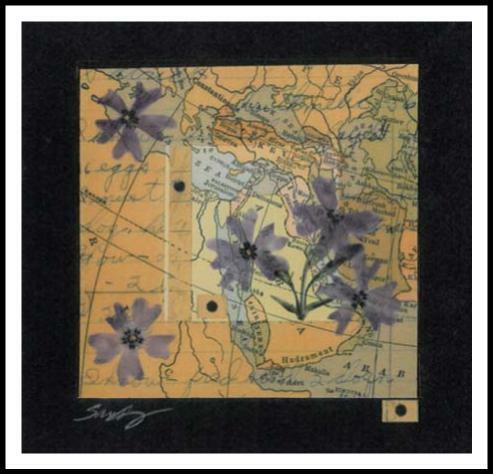 Print purple flowers onto vellum, cut out and adhere to artwork with double tack. For more information, visit http://kimberlysantiagoart.blogspot.com.